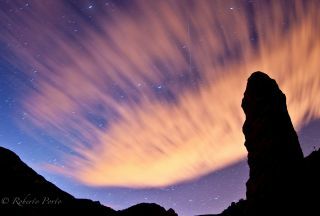 A Quadrantid meteor is seen streaking across a cloud-spattered sky with shadowy rocks in the foreground in this dazzling photo by astrophotographer Roberto Porto taken on Jan. 4, 2012 on Tenerife Island in Spain's Canary Islands during the meteor shower's peak. Early each January, the Quadrantid meteor shower provides one of the most intense annual celestial fireworks displays, with a brief, sharp peak lasting only a few hours. That peak occurs Friday (Jan. 3), but this year the sun will spoil the show for stargazers in North America. The 2014 Quadrantid meteor shower will peak Friday at 3 p.m. EST (2000 GMT), in the middle of the day for most of North America, so the best meteor views will be in other parts of the world, where night has already fallen. In 2014, a strong display of Quadrantid meteors is likely for central and eastern Asia, including Japan. As mentioned above, peak activity is expected at 3 p.m. EST (2000 GMT) Friday evening, when the radiant of this shower is ascending the dark northeastern sky. It will be early Saturday morning local time across Asia during the best viewing time, and with no moonlight to interfere this might turn out to be one of the best meteor displays of the year. Morning twilight will not interfere until about 6 a.m. local time. But what does that mean for those of us here in North America? Since it will be Friday afternoon along the East Coast and noon on the West Coast, observers will have to rise before dawn or wait until after sunset, local time. Both options mean observers will see fewer meteors in the night sky because of the peak period's unfortunate timing this year. If you venture out to look before sunrise on Friday morning, the meteor shower radiant will be well up in the northeast sky, but it will many hours before the actual peak. You might catch sight of perhaps 10 to 20 "Quads" during an hour's watch. There will likely be even fewer meteors that might be seen early on Friday evening, but these "might" turn out to be spectacular "earthgrazers" — meteors that skim across our upper atmosphere on long, majestic paths. The emanation point of the Quadrantids at that time will be low in the northwest sky. If you do head out to look for meteors, remember to bundle up! Just as with the Geminid meteor shower in December, observers should remember to wear warm clothing, make sure they are away from city lights (which can interfere with any meteor shower displays) and settle in to a reclining chair for a more comfortable viewing experience. Editor's note: If you snap an amazing photo of the Quadrantid meteor shower and you'd like to share it for a possible story or image gallery, please send images, comments and any other observing details to managing editor Tariq Malik at spacephotos@space.com. Thursday and Friday, Jan. 2 and 3, between midnight and dawn. The Quadrantid meteor shower peaks at 3 p.m. EST on January 2, during daylight. The best times to observe will be Thursday morning and Friday morning, between midnight and dawn. The meteors appear to radiate from a point between northern Bootes and the handle of the Big Dipper, once part of an obsolete constellation called Quadrans Muralis, the Wall Quadrant. Crumbs of a dead comet? Because the influx of Quadrantid meteors is sharply peaked, with the bluish "shooting star" streaks occurring at only half their maximum rate six hours before and after peak time, the stream of particles is a narrow one — possibly derived relatively recently from a small comet. In fact, in 2003, astronomer Peter Jenniskens of NASA, found a near-Earth asteroid (2003 EH1) that seemed like it wasin the right orbit to make the Quadrantids. Some astronomers think that this asteroid is really a piece of an old, "extinct" comet; perhaps a comet that was recorded by Chinese, Korean, and Japanese observers during the years 1490-91. Maybe that comet broke apart, and some of the pieces became the meteoroids that make up the Quadrantids. Quadrans Muralis is long-obsolete star pattern, invented in 1795 by J.J. Lalande to commemorate the instrument used to observe the stars in his catalogue. Adolphe Quetelet of Brussels Observatory discovered the shower in the 1830’s, and shortly afterward it was noted by several astronomers in Europe and America. Thus they were christened "Quadrantids" and even though the constellation from which these meteors appear to radiate no longer exists, the shower's original moniker continues to this day.